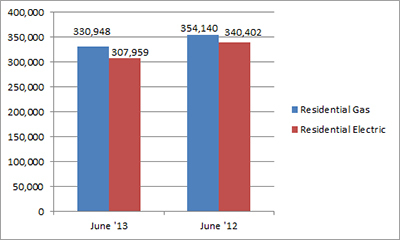 U.S. shipments of residential gas storage water heaters for June 2013 decreased 6.5 percent, to 330,948 units, down from 354,140 units shipped in June 2012. 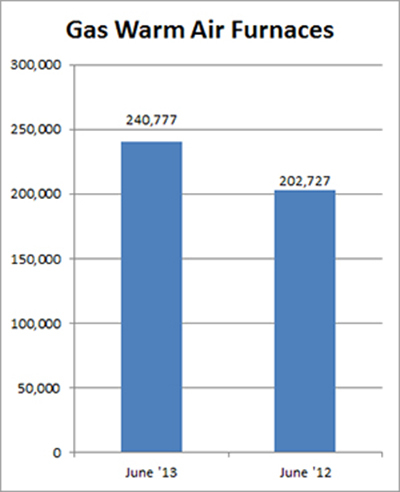 Residential electric storage water heater shipments decreased 9.5 percent in June 2013, to 307,959 units, down from 340,402 units shipped in June 2012. For the year-to-date, U.S. shipments of residential gas storage water heaters increased 7.8 percent, to 2,203,454, compared to 2,044,814 units shipped during the same period in 2012. Residential electric storage water heater shipments increased 5.5 percent year-to-date, to 2,052,910 units, compared to 1,945,961 units shipped during the same period in 2012. Commercial gas storage water heater shipments decreased 14.9 percent in June 2013, to 7,305 units, down from 8,588 units shipped in June 2012. 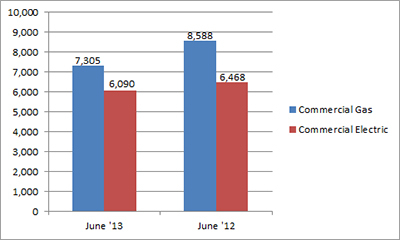 Commercial electric storage water heater shipments decreased 5.8 percent in June 2013, to 6,090 units, down from 6,468 units shipped in June 2012. Year-to-date U.S. shipments of commercial gas storage water heaters increased 10.3 percent, to 47,083 units, compared with 42,702 units shipped during the same period in 2012. Year-to-date commercial electric storage water heater shipments increased 3.3 percent to 34,022 units, up from 32,941 units shipped during the same period in 2012. 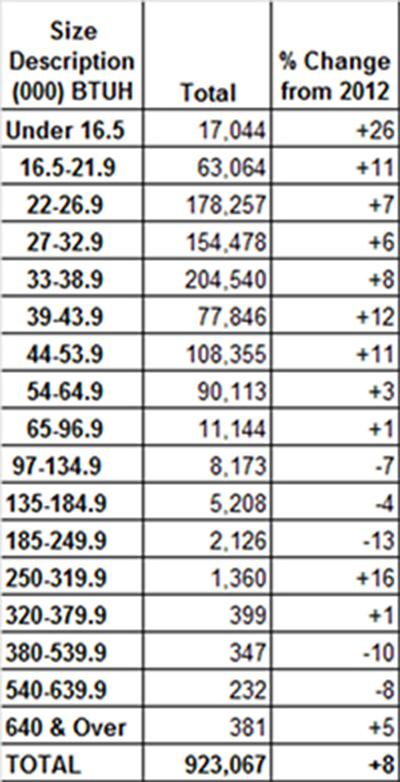 U.S. shipments of gas warm air furnaces for June 2013 increased 18.8 percent, to 240,777 units, up from 202,727 units shipped in June 2012. 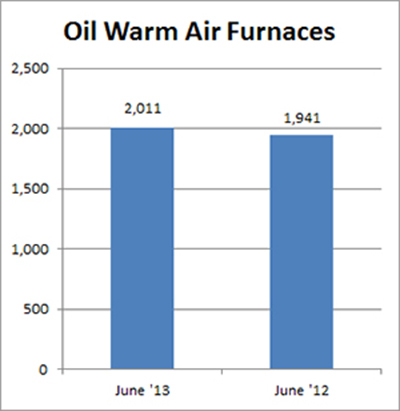 Oil warm air furnace shipments increased 3.6 percent, to 2,011 units in June 2013, up from 1,941 units shipped in June 2012. Year-to-date U.S. shipments of gas warm air furnaces increased 23.3 percent, to 1,165,778 units, compared with 945,613 units shipped during the same period in 2012. Year-to-date U.S. shipments of oil warm air furnaces decreased 5.8 percent to 11,784, compared with 12,515 units shipped during the same period in 2012. U.S. shipments of central air conditioners and air-source heat pumps totaled 923,067 units in June 2013, up 7.7 percent from 857,362 units shipped in June 2012. 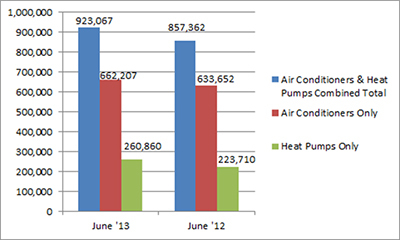 U.S. shipments of air conditioners increased 4.5 percent, to 662,207 units, up from 633,652 units shipped in June 2012. U.S. shipments of air-source heat pumps increased 16.6 percent, to 260,860 units, up from 223,710 units shipped in June 2012. Year-to-date combined shipments of central air conditioners and air-source heat pumps increased 9.7 percent, to 3,537,938 units, up from 3,226,041 units shipped in June 2012. Year-to-date shipments of central air conditioners increased 6.8 percent, to 2,410,521 units, up from 2,257,258 units shipped during the same period in 2012. The year-to-date total for heat pump shipments increased 16.4 percent, to 1,127,417 units, up from 968,783 units shipped during the same period in 2012.